Mini Vibra Lite 12 bathroom watch orange - Urifoon.nl - Underwunder - Special underwear. Feel good. Feel safe. This bathroom watch is the best one for children because of its size, 12 alarm moments and vibrating function. Does your child like playing better than going to the bathroom? That is very normal. But if children wait with going to the bathroom too long, it could cause accidents. Meaning, they will wet their pants unnecessarily. We say unnecessarily, because had your child listened to its bladder, it wouldn't have wet its pants. 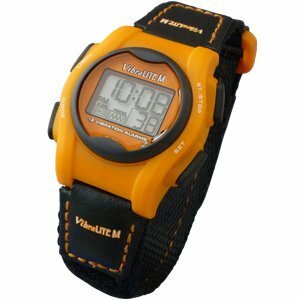 This nice-looking, child-friendly watch is a useful tool to help your child go to the bathroom in time during the day. It lets you set up to 12 alarms per day. More than enough to help your child remember to go to the bathroom in time. Of course, you can determine how many alarms you want to set yourself, but the watch allows you to set up to 12 alarms per day. You can also choose from 3 types of alarms: vibration, acoustic or a combination of both. The alarm can be switched off by pressing any button. If nothing is pressed, the alarm automatically stops after 20 seconds. This watch also offers the possibility of an automatic countdown on an interval set by you. This allows you to determine an interval between each alarm. For instance, every 90 minutes the alarm goes off to alert your child that it should go to the bathroom.